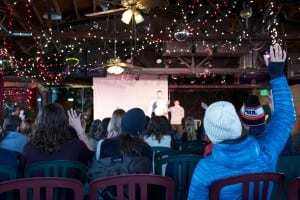 Last Saturday, arriving by bus and train and foot, people from all over the front range gathered for the Forward Food Summit, risking soaked socks and slipping ires in the forewarned return of winter. When I arrived at the Mercury Cafe, the air already buzzed with excited murmurs as, wet boots squeaking and noses sniffling, concerned citizens gathered to share tales of battle and redemption; to break bread with comrades; to dream a future as a community. The Food Rescue Alliance and their guest speakers hosted “conversations on food and economic justice” without shrinking from the immense complexity of the systems that affect health and wealth in Colorado. The entire affair went off in truly epic style. The first collaborative Front Range Forward Food Summit, this year’s event brought attendees from Boulder, Denver, Colorado Springs, and other cities in the region. In six sessions, speakers and audience addressed together issues ranging from wage inequality to corporate food retail. Laura from the Community Language Cooperative helped warm up the day’s discussion with an anti-oppression workshop. Placing a garbage can at the front of the room, she asked each audience member to try to throw a balled up piece of paper into the can—without moving from our seats. The physical representation of privilege—some were so close to the can they could not miss, while others sat so far they could not see the target—got people talking about the challenges created by real-world inequality. For me, one highlight of the Summit was the Living Wage Panel, facilitated by Asia Dorsey of Five Points Fermentation. Dorsey kicked off the panel with a question so fundamental to justice work, and yet so often unaddressed: “Why should we care about the wages of other people?” The panelists, Nikhil Mankekar, an organizer in Boulder, and Maggie Gomez of 9 to 5 Colorado, have both centered their work on caring about fair payment of employees. They fired back powerful responses. To Gomez, the reason for her passion is simple: “If you work forty hours a week, you should be able to feed yourself,” she said. The speakers at the Summit represented micro-businesses, nonprofits, youth groups, cooperatives, and corporations, a cross-section of the communities affected by food and economic justice. But a chilling moment came when one of the speakers asked how many people in the audience lived in a food desert. Only a few hands rose. It brought into my mind the question of what must be done to bring more of those voices into the room. They are vital to an understanding of the full scope and impact of the food and economic systems we seek to change. Nevertheless, the day can be summed up in the words of one of the representatives of a group of women starting a food-related micro-business in Globeville and Elyria-Swansea [translated from Spanish]: “We all come from different backgrounds. We all have different capabilities. But we also all have dreams.” The speakers and attendees of the Forward Food Summit dared to speak many ambitious dreams on Saturday. I hope they flourish through our actions as we move Forward from this inspiring weekend.